Icy conditions will make the journey to work a difficult one for many people, forecasters have warned. Snow falls across much of the UK froze during the night and are expected to make driving conditions treacherous. Many routes in the Midlands and the south of England were turned into ice rinks on Wednesday evening, causing lengthy delays for travellers. Two hundred flights from Heathrow were cancelled and Gatwick, Stansted, Luton and Birmingham airports were also hit. Eleven train companies also reported delays. Temperatures little above freezing will fail to melt the snow and ice in many areas on Thursday. A BBC Weather Centre spokesman said: "The worst conditions will be on the roads, which will be icy, particularly the A and B roads that have not been gritted yet." Towards the weekend, temperatures will continue to rise and much of the snow will melt. Before then there is a chance of further snow in Scotland, which has seen falls up to 25 centimetres deep and drifting caused by high winds. Traffic is expected to be slow on many key routes, after heavy delays on Wednesday. The M25 was one of the worst affected and the AA said that, by the early hours of Thursday morning the situation was still "horrible", with miles of stationary traffic between junctions 24 and 26. 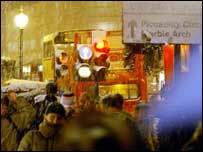 Traffic gridlock also hit Birmingham, where motorists took up to eight hours to travel short distances. Lengthy delays were also reported in Sheffield, Luton and Norwich. The Highways Agency gritted England's motorways and trunk roads, but some motorists said they could not see what good it had done. A spokesman for the Agency warned: "Drivers really need to make an assessment whether they need to make a journey and if they do, they need to be really, really careful." The RAC took a call every three seconds from drivers needing help. A 70-year-old man died when his Range Rover left a snow-covered private road and turned over in the grounds of Ravensthorpe Manor near Thirsk, in North Yorkshire. And a 30-year-old man was seriously injured in an accident on an icy M18 near Doncaster, when his car collided with a road sign and overturned. In Scotland, an estimated 70,000 children missed classes as severe weather led to the closure of more than 300 schools. Areas of the north-east Lincolnshire also saw school closures amid five inches of snow, and north Yorkshire saw eight. Several schools were also closed in Wales. "Just as last year, the argument about how well we coped with the snow is raging""